Many thanks to Paul Doleman for sending in this fabulous old image of Hoylake Station. You might not think so, but I’d suggest our Grade II Listed station really is quite a stunning a building – it’s a shame that the ‘Hoylake’ sign on the roof is long-gone. Remind me, what’s that huge building in the background? It sticks out like a sore thumb! Oh, on an unrelated note, if you’re still feeling the warm glow of St Valentine’s Day, visit my fledging West Kirby site and have a look at this topical photo. Was the old gasworks still there then? Is it the old incinerator at the refuse depot? Am pretty sure it was the old coke works, nothing to do with a waste incinerator. I remember that building in the background ,it was part of the Gas Works site but I`m not sure just exactly what its purpose was. The large building in the background, of the picture of Hoylake Station was the Gas Works. During the 1940s my brother and I would push our home made carts along the cinder path from Orrysdale Road in West Kirby, to Hoylake Gas Works, to collect bags of coke. I think it was about sixpence a bag. Much cheaper than coal.This was not an uncommon thing for yougsters to do in those days., My wife who lived in mount Pleasant Road in Wallasey, tells me she and her brother pushed there cart all the way to the gas Works in Gorsey lane to collect coke. Can anyone imagine the present day pampered children doing that. Yes. what a fabulous building it was,, and still is. I don’t remember the lettering on the top but it would be wonderful,if it could be replaced. I must get round to doing a 30s style drawing of it…. The sore thumb in the background – we used to call it the Gas and Coke works. You could smell it too! Not an unpleasant smell…. of gas and coke, not surprisingly… ! Hi Mason, I’m guessing you are the son of Les and Carrie Edwards who were good friends of my parents, Mike and Peggy Vine. The ‘Sore Thumb’ in the background of the picture was part of the Hoylake & West Kirby Gasworks. Thankfully, this glorious monstrosity has been demolished. I seem to remember you had other pictures of it and the site published on Hoylake Junction sometime around June 2011. Great photo. On a closely related topic I will ask again if anyone has an answer as to why Manor Road station was built? Given that it is a mere stones throw from Hoylake station why build it? There is no great housing to serve it – thoughts? I used Manor Road station extensively in the late 70s and early 80s and was very thankful that it was there given the time it would have taken to walk from where we lived (Avondale Road) to either the Hoylake station or Meols – I actually think that Manor Road actually serves a slightly more dense residential area than does Hoylake station. I wonder if the distance between the two would compare to that between some of the Birkenhead stations? Do I remember correctly that Hoylake Station was ‘grander’ than most because it was the end of the line. Then the line was extended to West Kirby much later. ? No, I don’t think that’s right. 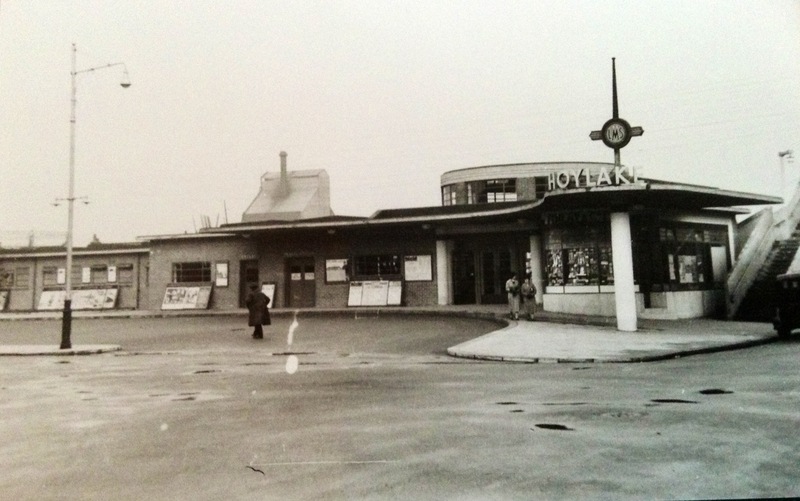 There was an earlier station building at Hoylake and I’m sure that when the line got as far as Hoylake it simutaneously reached West Kirby in order to connect with the West Kirby – Hooton line. The railway reached Hoylake in 1866 but was not extended to West Kirby until 1878 according to a book I have read about the Wirral Railway and it`s predecessors. Hi, I remember when I was five years old my mother took me in the evening to the V.E. Celebrations and there was a Band playing on the roof and every one was dancing. There is a lovely photograph in the Archives in the Hoylake Library, I have got a copy of it . Hi, I can tell you as a past (HUDC) employee the building you can see in the distance is the old hoylake refuse incinerator, the building is still there without the towering roof chimney. I have an aerial view picture of Hoylake in 1936 which does show the gas works in carr lane which has long gone but is not the same building in Hoylake station picture. Glad you posted. I too thought it was the old incinerator ( see my earlier post). My late father in law worked for Hoylake UDC as it then was- at the newspaper baling place. (William- (Bill)- Brumfitt) . But like lots of people have said the ugly old gas works weren’t far away. Like everywhere else Hoylake seems to have changed a lot. I’ve not been there for 12 years but am planning to visit in April. Guess I won’t know the old place.